A compact European space probe, already fitted with a propulsive boost stage to send it a million miles from Earth, has arrived at its French Guiana launch base for liftoff in early December aboard a solid-fueled Vega rocket. The craft’s mission is experimental, aimed at proving out the technical apparatus required to detect gravitational waves, ripples in the fabric of spacetime predicted by Albert Einstein’s theory of general relativity. Known as LISA Pathfinder, the mission has cost the European Space Agency about 430 million euros ($490 million), but it is just the first step in a long-term program to study the “invisible universe” by observing unseen gravity waves created from the motion of massive objects like black holes. 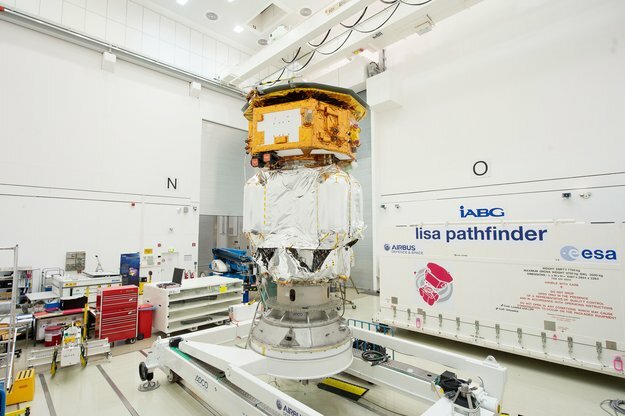 “This is an extremely challenging mission that will pave the way for future space-based projects to observe gravitational waves, opening a new window to explore the cosmos,” said Paul McNamara, ESA’s LISA Pathfinder project scientist. Lasers buried inside the LISA Pathfinder spacecraft will measure the motion of two gold-platinum alloy cubes 46 millimeters (1.8 inches) on a side. Free-floating inside vacuum enclosures, the motion of the cubes will be measured to one thousandth of one millionth of a millimeter. Micro-thrusters mounted outside the probe, coupled with specialized control software, will carefully regulate the movement of the spacecraft to keep the gold-platinum test masses floating inside their housings. The goal of the spacecraft is to keep the test cubes floating in an electrostatic field free from outside influence, demonstrating the masses can remain in near-perfect free-fall. 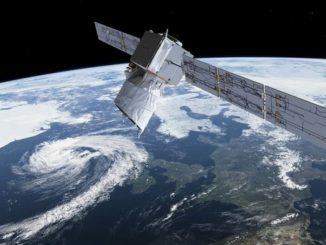 Such an achievement is vital to an ambitious multi-spacecraft gravity wave observatory planned for launch by ESA in the 2030s. Instead of having two free-floating 38 centimeters (15 inches) apart, the future mission will attempt to measure the exact distances between test masses up to millions of kilometers apart. “Gravitational waves are an entirely fresh and different way to study the universe, providing an important complement to the well-established approach of astronomy, based on observing the light emitted by celestial bodies,” McNamara said in a statement. 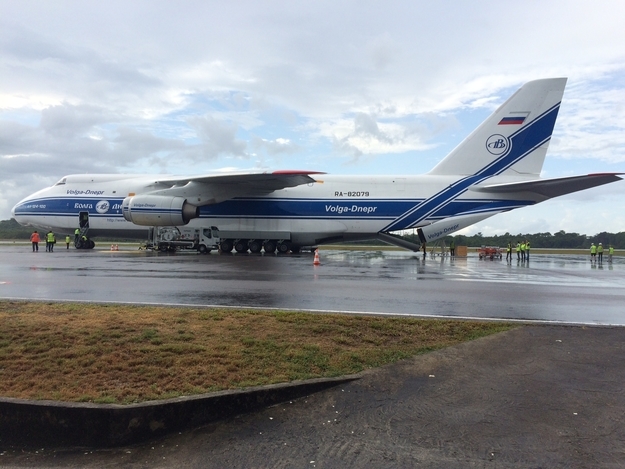 The spacecraft flew inside an Antonov An-124 cargo plane from London Stansted Airport, near LISA Pathfinder’s factory at Airbus Defense and Space, the mission’s prime industrial contractor, to the European-run spaceport in Kourou, French Guiana, on Oct. 8. 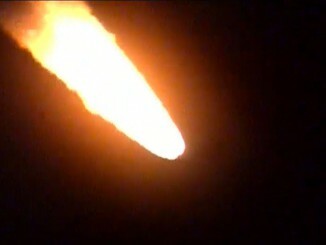 After landing at the airport in French Guiana’s capital city, Cayenne, the spacecraft was trucked to the Guiana Space Center to begin final preflight processing. The spacecraft came from Europe to South America in launch configuration, according to Cesar Garcia Marirrodriga, ESA’s project manager. Final checks on the probe will be completed in the coming weeks, followed by fueling of the craft’s purpose-built propulsion module. Technicians will also install the flight clamp band connecting LISA Pathfinder’s propulsion and science modules, Marirrodriga told Spaceflight Now via email. Then the 1,910-kilogram (4,210-pound) spacecraft will be hoisted atop the four-stage Vega booster inside its payload shroud in November. Liftoff is set for Dec. 2 at 0415 GMT (11:15 p.m. EST on Dec. 1) aboard the sixth flight of Europe’s new lightweight Vega launcher. 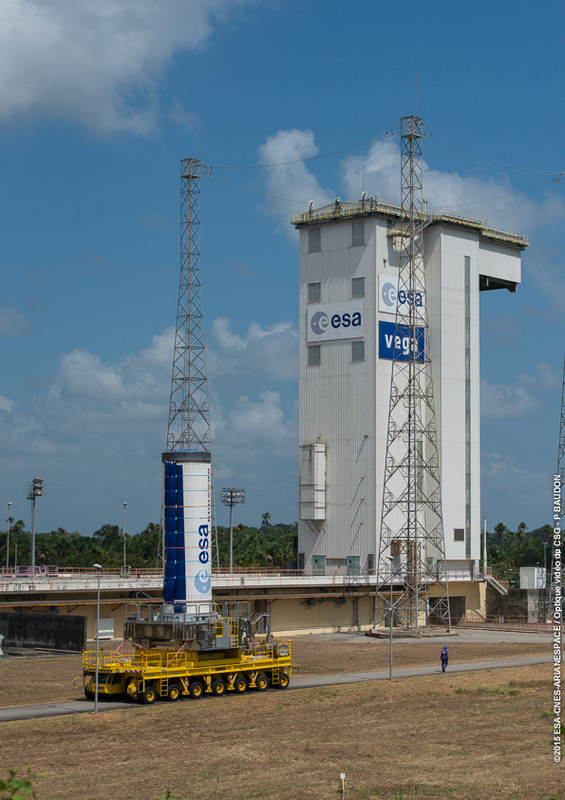 Assembly of the Vega booster began in late September with the mounting of the rocket’s first stage P80 solid rocket motor at its launch pad in French Guiana. The Vega’s fourth stage kick engine will put LISA Pathfinder into an an elliptical orbit around Earth, then the craft’s on-board propulsion module will fire six times to boost its altitude higher over a two-week orbit-raising phase. The probe will eventually pick up the speed necessary escape orbit and fly to the L1 Lagrange point, a gravitationally stable spot about 1.5 million kilometers (930,000 miles) on the sun’s side of the Earth. The spacecraft will jettison its disposable propulsion module after it is on course for its operating post at L1. 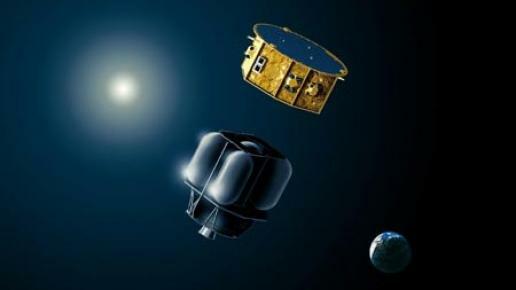 LISA Pathfinder will enter a looping orbit around the L1 Lagrange point around the beginning of February, followed by a six-month prime operational mission phase. “The extreme precision of measurements and control required in this domain pose a great technical challenge,” Marirrodriga said in a statement. “In fact, everything was a challenge in this brand-new class of missions: from the innovative instrumentation, to the new modelling of self-gravitation within the spacecraft, and the very complex integration tests of the spacecraft. 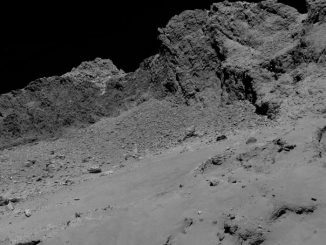 “The industrial and scientific teams that undertook these daunting tasks have done an extraordinary job, and now the mission is ready for launch,” he said.